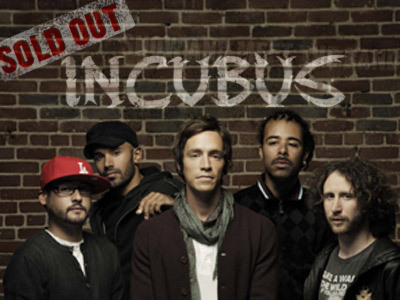 Obviously, I worship the Church of Boyd (sorry, mom) — and has been an avid Incubus fan for almost ten years now. I credit my dedication to my next door neighbor who let me borrow his bootlegged copy of “MAKE YOURSELF” and provided me a basic description of the band. It was 2001, and I was fresh out of college — by the time I heard the first strains of the guitar hook on “Drive”, I was hopelessly hooked. Now after ten years of being an avid fan, and looking forward to ten more (and ten more…. 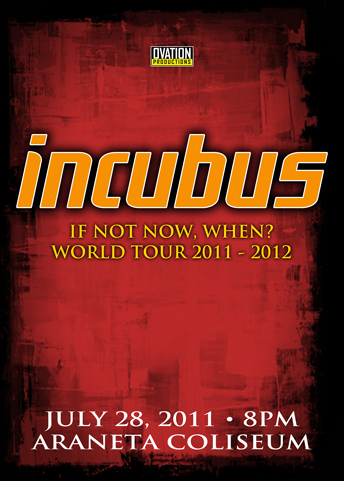 ), Incubus is finally back in Manila to treat us fans to a night of poetic music laced with catchy beats. Mark your calendars, file your vacation leave (like I always do) and make sure you have your tickets: Incubus. Manila. July 28, 2011. The world is right again. The Pacific Rim tour is to celebrate the release of their newest album, “If Not Now, When?” on July 12, 2011 and features the carrier single “Adolescents”. I was there when they first had their big concert in March 2004, and was back again for the 2008 concert in Araneta Coliseum. And now–barring the end of the world–no one and nothing can make me NOT go and watch them for the third time. 2. Bathing in sand and other “unmentionables” at the same aforementioned concert. Somewhere right at the middle of the performance, someone started throwing sand at the crowd. My hair was full of sand, plus it smelled awful (see post above) plus people are getting unruly. I was truly a sight to behold. 3. Realizing that somewhere “down the line”, I will marry the guy who came with me to see Incubus — the who guy protected me from the heavy blows bumps, pushes and shoves from the crowd. (I was still not a fat lump that time and was quite frail and sickly compared to today’s standards). The guy also appreciated and understood my weird fanaticism with anything Brandon Boyd and Incubus. And yes, I did get to marry him…and one of the songs in our wedding set list is “Stellar”. 4. Writing about my first Incubus concert experience and submitting the piece to a national publication. The piece was titled, “A leap into the Boyd”. 5. ULTRA FAN MODE: Hotel stalking Incubus. nuff said. 9. This did not happen WHILE in concert, but let’s just say, I was able to meet SOMEONE who became a very, very good friend just because of Incubus. Incubus fandom = priceless. Meeting a lifelong friend because of Incubus = MORE PRICELESS. I am already excited. Nothing beats crappy existence than a dash of good news, don’t you think? Yes, yes, Incubus is coming back! I’m excited for this one! And being the fangirl that I am, I think…I’m not sure, but I THINK, I cut out that article of yours…I’ll check my clippings! i hope you managed to cut it out…am looking for a copy, i can’t find mine anymore. hehehe! hey thanks for visiting. seriously? are u the trippy guy i mentioned in number 1? haha! are u watching tomorrow? hey! (no offense meant ha!) but i was so glad to read this, being a fellow incubus fan girl and all. after seeing them last thursday,i was wondering if they will ever comeback for the fourth time, and if they ever did, can i still be a fan, even if i am “not-in-the-bloom” stage of my age? you inspire and made me realize, that Incubus’ music is not a one hit wonder like the rest of these music fads, and stripped all the hulabaloos of Boyd’s smokin looks, it is all about them making good music.it won’t matter, and i won’t care, that i jump and scream my guts out with their newly found teeneager followers! i must say, # 3 is “nakakakilig”, damn. = ) and i also had # 9! To say that i have inspired you has tremendously made my day. I don’t think I’ll ever quit being an Incubus fan. You’re right, more than Mr. Boyd’s good looks — it is the music and the genius of their one of a kind hooks that makes fans out of all us, yes even us who have been past the “angst-y teenager phase”. Hahaha! About #3, I still get kilig thinking about how my hubby made “tiis” to the hell that was the mosh-pit more than 8 yrs ago. Till now, he knows that Incubus means the world to me. 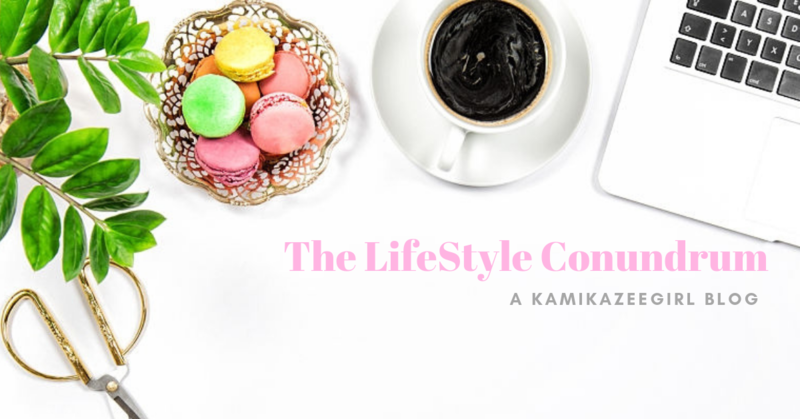 Thank you for visiting my little space in cyberspace. Keep the music alive!